Some time ago, I found myself trying to explain to a journalist why I opposed CO2 mining in Tuscany. I said something like, “it makes no sense that the regional government spends money to reduce CO2 emissions and, at the same time, allows this company to extract CO2 that, otherwise, would stay underground.” “But”, the journalist said, “I have interviewed the people of this company and they say that the CO2 they extract is not dispersed into the atmosphere – it is stored.” “And where is it stored in?” I said. “They sell it to companies that make carbonated drinks.” I tried to explain to him that producing Coca Cola or Pepsi is not the way to fight climate change, but I don’t think he really understood. This is typical of how difficult is to make some messages pass in the public debate. Among the many possible ways of mitigating global warming, carbon capture and sequestration (or storage) – CCS – is the least understood, the most complicated, and the most likely to lead to pseudo-solutions. Not surprising, because it is a complex story that involves chemistry, geology, engineering and economics. I have no doubt that there is something good in the new process. Scrubbing CO2 using solvents is a known technology and it can surely be improved. Technology is good at doing exactly that: improving known processes. The problem is another one: is it a really an “emission-free” process? And the answer is, unfortunately, “not at all”, at least in the form the idea is presented. The problem, here, is that all the hype is about carbon capture, but there is nothing in these claims about carbon sequestration. 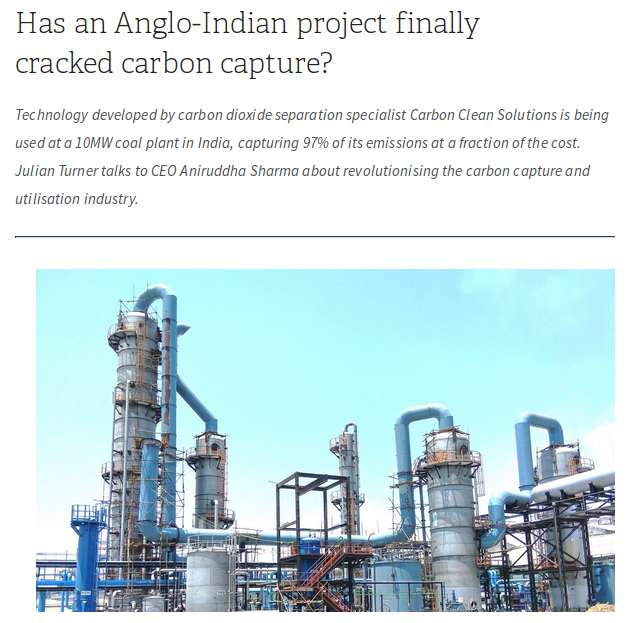 Indeed, the article discusses “carbon capture and utilization” (CCU) and not “carbon capture and sequestration” (CCS). Now, CCS is supposed to mitigate global warming, but CCU does NOT. Let’s go back to basics: if you want to understand what CCS is about, a good starting point is the 2005 IPCC special report on the matter (a massive 443-page document). More than ten years after its publication, the situation has not changed very much; as confirmed by a more recent report. The basic idea remains the same: to transform CO2 into something that should be stable and non-polluting. And when we say “stable” we mean something that should remain stable for time spans of the order of thousands of years, at the very least. This is what we call “sequestration” or “storage”. A tall order, if there ever was one, but not impossible and, as it is often the case, the problem is not feasibility, but cost. The safest way of storing CO2 for very long times is to imitate the natural process of “silicate weathering” and transform CO2 into stable carbonates, calcium and magnesium, for instance. It is what the ecosystem does in order to regulate the temperature of the planet. But the natural process is extremely slow; we are talking about times of the order of hundreds of thousands of years; not what we need right now. We can, of course, accelerate the weathering process but it takes a lot of energy, mainly to crush and pulverize silicates. A less expensive method is “geological storage”, that is pumping CO2 into an underground reservoir. And hope that it will stay there for tens of thousands of years. But it is the main aim of CCS, nowadays. This said, the way to evaluate the feasibility and the opportunity of the whole concept of CCS is to examine the life cycle of the whole process; see how much energy it requires (its energy return for energy invested, EROEI), and then compare it with the data for alternative processes – for instance investing the same resources into renewable energy rather than in CCS (and renewable energy may be already less expensive than coal produced electricity). But it seems that this comparative analysis has not been done, so far, despite the several cost analysis performed for CCS. One thing that we can infer from the 2005 report (see page 338) is that, even without scrubbing, the energy necessary for the whole process might be not so far away from values that would make it an exercise in digging holes and then filling them up again, as John Maynard Keynes is reported to have proposed. The situation is better if we consider geological storage, but even in this case scrubbing is only a fraction of the total cost. At this point, you can understand what’s wrong in calling the new scrubbing process a “game changer.” It is not that. It is a process that improves one of the steps of the chain that leads to carbon storage, but that may have little value for CCS, unless it is evaluated within the whole life cycle of the process. Then, in the whole article by Turner, there is no mention of CCS/storage. They only speak of carbon capture and utilization (CCU) and they say that the CO2 will be sold to another company that will turn it into soda ash (Na2CO3). This compound could then be used it for glass making, urea making, and similar purposes. But all these processes will bring back the captured CO2 to the atmosphere! No storage, no global warming mitigation – they might as well sell the CO2 to the industry that makes carbonated beverages. This is not the breakthrough we need. So, what sense does it have to make so much noise about “clean energy,” “clean electricity,” and “emission-free” energy when the new process aims at nothing of that sort? Not surprising, it is all part of the “fact-free” ongoing debate. To conclude, let me note that this new scrubbing process might just be one of those ways of “pulling the levers in the wrong direction,” according to a definition by Jay Forrester. That is, it may be counter-productive for the exact purposes it had been developed for. The problem is that pure CO2 is an industrial product that has a certain market value, as the people who extract it from underground in Tuscany know very well. So far, the cost of scrubbing has prevented the exhaust of fossil-fueled plants from having a market value, but a new, efficient process could make it feasible to turn it into a saleable product. That would make coal plants more profitable and would encourage people to invest into building more of them, and that would generate no reductions in CO2 emissions! It would be even worse if the coal industry were to sell to governments their scrubbing process in order to escape carbon taxes. So, you see? Once more, the rule of unintended consequences plays out nicely. Ugo Bardi teaches physical chemistry at the University of Florence, in Italy. He is interested in resource depletion, system dynamics modeling, climate science and renewable energy. Contact: ugo.bardi(whirlything)unifi.it. He blogs at Cassandra’s Legacy where this article first appeared. The coke and Pepsi corporates have percolated deep into society . Despite right activists and environments voicing their concern, the government’s are not at all bothered. These ‘ unhealthy’ beverage making tycoons have their own set of the ‘ scientist brigade’ to defend ..